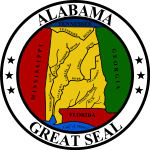 The 2004 United States presidential election in Alabama took place on November 2, 2004. Voters chose 9 representatives, or electors to the Electoral College, who voted for president and vice president. 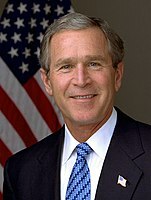 Alabama was won by incumbent President George W. Bush by a 25.6% margin of victory. Prior to the election, all 12 news organizations considered this was a state Bush would win, or otherwise considered as a safe red state. On election day, it trended Republican sharply, by a swing margin of 10.7% from the 2000 election. Bush won with over 60% of the vote, a first since 1984, and carried most of the counties and congressional districts. Historically, Alabama is a very reliable Republican state that a Democratic presidential nominee hasn't won since 1976, when the Governor of the state next door, Jimmy Carter of Georgia ran and swept the Deep South. With the exception of Oklahoma in 2004, the state was also Bush's best performance in the South, with not even Texas, Bush's home state, voting as red as Alabama. As of the 2016 presidential election [update], Bush is the last Republican to carry Jefferson (home of Birmingham, the state's largest city), and majority-black Marengo counties in a presidential election. Republican George W. Bush won every congressional district, except the 7th one, which is a Democratic stronghold. Technically the voters of Alabama cast their ballots for electors: representatives to the Electoral College. Alabama is allocated 9 electors because it has 7 congressional districts and 2 senators. All candidates who appear on the ballot or qualify to receive write-in votes must submit a list of 9 electors, who pledge to vote for their candidate and his or her running mate. Whoever wins the majority of votes in the state is awarded all 9 electoral votes. Their chosen electors then vote for president and vice president. Although electors are pledged to their candidate and running mate, they are not obligated to vote for them. An elector who votes for someone other than his or her candidate is known as a faithless elector. ^ a b "Election 2004 Polls - Dave Leip's Atlas of U.S. Presidential Elections". Uselectionatlas.org. Retrieved 8 October 2014. ^ "George W Bush - $374,659,453 raised, '04 election cycle, Republican Party, President". Campaignmoney.com. Retrieved 8 October 2014. ^ "John F Kerry - $345,826,176 raised, '04 election cycle, Democratic Party, President". Campaignmoney.com. Retrieved 8 October 2014. ^ "CNN.com Specials". Cnn.com. Retrieved 8 October 2014. ^ "CNN.com Election 2004". Cnn.com. Retrieved 8 October 2014. ^ "Swing State Project". Swingstateproject.com. Retrieved 8 October 2014. ^ "Dave Leip's Atlas of U.S. Presidential Elections". Uselectionatlas.org. Retrieved 8 October 2014.